With construction and energy costs consistently rising, and the domestic housing market near its saturation point, architects and engineers need all the help they can get to make their designs desirable to contractors and builders. Incorporating spray foam insulation into building plans offers tax benefits, green housing credits and other incentives for LEED-certified construction. Learning the practical advantages of spray foam insulation, and working them into a client pitch, can put an architectural firm ahead of its competition. Here are some of the critical reasons spray foam is winning advocates among architects and designers. Moisture is one of the worst influences on structures, from weakening foundations to rotting roof shingles. Spray foam insulation helps mitigate the risks of rain and melted snow by providing an air barrier which fiberglass insulation cannot. By efficiently sealing insulated areas with a reliable air barrier, spray foam prevents leaks, limits mold growth, and vastly extends the life of timber and ferrous-metal structures. Another advantage spray foam has over traditional insulation materials is the flexibility it allows during the design stage. Architects have to be aware of the limits housing materials impose, laying sheets of fiberglass and rolls of foil limit the shapes and angles a floor plan can use. Spray foam, on the other hand, molds itself to its receptacle and/or curved walls, allowing for alternative design layouts, which make the kind of unique designs that win contracts. Sustainability is one of the many considerations that are factored into a client’s decision to buy an architect’s design. Poor design and materials that require constant maintenance may scare away potential customers because of the time and costs of maintaining. 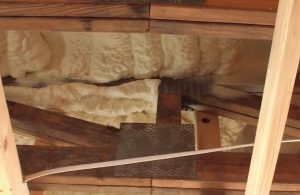 Spray foam insulation helps mitigate that factor by creating a continuous air barrier; this creates a stable, controlled environment indoors, which in turn extends the useful life of almost everything in the building, from drywall to carpets. Architects must make their designs attractive to developers and private homebuyers alike, and increasingly clients are discovering the advantages of buying energy-efficient models. Spray foam insulation helps designers meet both of these demands by creating a durable, useful envelope around almost any property and dramatically improving both its efficiency and longevity. For more information on spray foam insulation, contact USI online to find a branch near you. USI believes in excellence in every step of the process and ensures timely completion and quality of service, time after time.